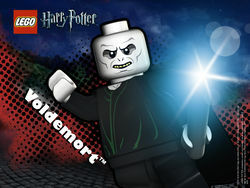 Lord Voldemort (formerly known as Tom Riddle) is a Harry Potter Minifigure partially introduced in 2001 (on the back of Professor Quirrell's head), and introduced as a proper Minifigure in 2005. Voldemort acts as the main antagonist in the series. 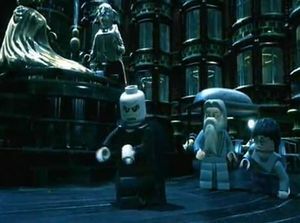 The first version of Voldemort was featured on the Professor Quirrell minifigure in 2001. He had his face printed on the back of Professor Quirrell's head, which could be revealed by removing Quirrel's turban. This variant of Voldemort's face was yellow in colouration, and featured red eyes. 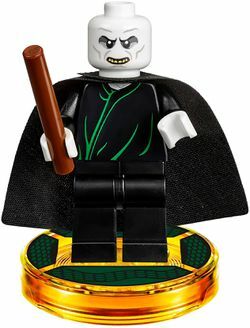 The next variation of Voldemort, in 2005, featured the Dark Lord having his own minifigure. His face was the same as the one on Professor Quirrell; however, it was was printed on a glow-in-the-dark minifigure head instead of a yellow head. He also featured a gray cloak which was also used with the older variation of the Dementor minifigure. He only had a basic unprinted black body and legs, but his hands were white. His wand was also black in this variation. In his third variation, introduced in 2010, his minifigure received a big re-design from the previous variations. He now had a new face, on a white minifigure head. He now featured a black cape and also had a printed torso. He even had a new wand which was white instead of black. This variation was acceptably unique to the previous variations of Voldemort and this variation also had a more similar look to Voldemort in the late Harry Potter movies. In 2016, he was released in a Dimensions pack along with Harry Potter. His design this time round is almost identical to that in 2010, but without a nose and his white wand replaced with a shorter brown one. He comes with an exclusive toy tag which is coded with in-game data for his character. The tag is cast in transparent flame yellowish orange and decorated with character-specific printing. Lord Voldemort was originally born Tom Marvolo Riddle. His mother was Merope Gaunt, a descendant of Salazar Slytherin, who died in childbirth. His father was Tom Riddle Sr, a Muggle, who abandoned Merope after learning she was a witch. Riddle was raised in an orphanage. When he discovered his wizard powers, he used them to abuse the other children. Then, a younger Albus Dumbledore came to take him to Hogwarts. Tom, thinking Dumbledore was a doctor or psychologist there to take him to an asylum, refused to go until Dumbledore demonstrated his power. At Hogwarts, Tom was a good student, and a very skilled wizard with many unique abilities such as parseltongue. All the teachers liked him, especially Professor Slughorn, who told Tom the nature of horcruxes in his later years. During one point, he persuaded then-headmaster Armando Dippet to allow him to stay there. When he was 16, he opened the Chamber of Secrets. The Basilisk inside killed Moaning Myrtle (Whose death he used to make his first horcrux, the Diary which would later take control of Ginny Weasley). He accused Rubeus Hagrid and his pet spider Aragog of killing Myrtle and got him expelled. Riddle got a trophy for "Special Services to the School". After he graduated, Riddle applied for the Defense Against the Dark Arts post twice, but was turned down. He visited his mother's old home, where he met his uncle Morfin Gaunt, who said he looked like "the filthy muggle who stole Merope." Tom, now known as Lord Voldemort, killed his father and grandparents (which allowed him to make his second Horcrux, Marvolo Gaunt's ring, which was the Resurrection Stone), framed their gardener Frank Bryce, and altered Morfin's memory to convince him he did it. He later assembled a group of followers which included Bellatrix Lestrange, insane cousin of Sirius Black, her husband and brother-in-law Roldophus and Rastaban Lestrange, Lucius Malfoy, Draco Malfoy, Narcissa Malfoy, Fenrir Greyback, Peter Pettigrew, Walden Macnair, Severus Snape, Igor Karkaroff, Evan Rosier, Crabbe Sr., Goyle Sr., Avery Sr., Avery Jr., Mulciber Sr., Mulciber Jr., Nott Sr., Amycus and Alecto Carrow, Antonin Dolohov, Barty Crouch Jr., Yaxley, Thorfinn Rowle, Regulus Black, Professor Umbridge, Augustus Rookwood, Gibbon, Jugson, Selwyn, Travers, and Wilkes. Voldemort also made 3 more Horcruxes: Salazar Slytherin's locket, Rowena Ravenclaw's diadem, and Helga Hufflepuff's cup. On Halloween in 1981, Peter Pettigrew revealed where the Potters were, Voldemort set off to find them. When he got to their house, James Potter tried to hold off Voldemort so his wife and child could escape but he left his wand in another room and Voldemort killed him with the killing curse. Upstairs he tried to force Lily Potter away so he could kill her son, but she refused to leave and he killed her with the killing curse. Then he cast the killing curse at their infant son Harry, but because his mother sacrificed herself for him it gave him protection, which caused the curse to bounce off Harry (giving him a scar) and hit Voldemort, destroying his body, and fused a part of his soul with Harry's scar, making him a Horcrux. Voldemort's soul managed to stay alive due to his Horcruxes. After his body was destroyed he fled and hid in a forest in Albania for ten years until Professor Quirrell came along. He latched onto the back of Quirrell's head and went back with him to Hogwarts. Voldemort forced Quirrell to drink unicorn blood to strengthen him. He then tried to get the Philosopher's Stone, but was thwarted by the one who caused his first downfall: Harry Potter. Riddle hid in the same Albanian Forest for another three years until Peter Pettigrew found him. Later, Voldemort got a rudimentary body as part of a plan to resurrect him. One Death Eater, Peter Pettigrew, found him and cut off his hand, dug up the bones of Tom Riddle Sr. and used Harry Potter's blood in the resurrection process of Lord Voldemort. Then once again he tried to kill Harry. But when they started casting spells at each other, they became locked in the priori incantem, and Harry, with the help of some spirits Voldemort had killed (Cedric Diggory, Frank Byce, Bertha Jorkins, Lily Potter, and James Potter), he managed to get himself and Cedric's body back to Hogwarts. A year later, The Dark Lord began to try to steal the prophecy that told the secret of his and Harry's fate. He became aware of his connection to Harry's mind and used it to lure Harry to the Ministry of Magic, where Riddle battled Albus Dumbledore and almost got away with the prophecy, until it was dropped. About two years after his defeat at the ministry, Lord Voldemort and his Death Eaters took over Hogwarts Castle and the Ministry itself, ruling over the wizarding world. He learned, from Mr. Ollivander, that the reason he could not kill Harry was due to the fact that his and Harry's wand shared the same core, making them unable to kill one another. After taking Lucius Malfoy's wand and having it shattered by a spell Harry casted, Voldemort began to search for the Elder Wand, the most powerful wand in the world. He believed that it would be the one thing that would finally kill Harry Potter. He searched for it until he found out that the last owner was Dumbledore himself. He stole it from the grave of the now dead Dumbledore. Meanwhile, Harry, Ron and Hermione had defeated all the horcruxes but the snake, and the Battle of Hogwarts was where the final duel happened. Voldemort "killed" Harry in the woods, not knowing that Potter himself was a horcrux he accidentally created when he gave him the scar all those years ago. Harry came back to life minutes after and Neville Longbottom decapitated Nagini, leaving Voldemort mortal. Harry battled the Dark Lord one more time, and in the end, due to the fact that the Elder Wand never belonged to Riddle, he, himself, was killed by his own rebounding curse, ending his rule of tyranny once and for all, just like it started, with his own curse. The preliminary design of the 2010 Voldemort had green robes with black printing. 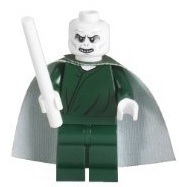 This minifigure was never released; the final version had black robes with green printing. 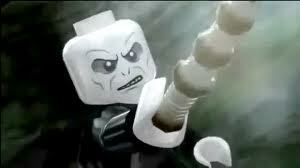 Voldermort is one of very few LEGO minifigures to have a nose (of sorts). This was design element was dropped when he was released as a Dimensions figure. Lord Voldemort appears at the 2010 toy fair. The dark lord on the back of Quirrell's head. Voldemort casting a spell at the Ministry of Magic. This page was last edited on 22 August 2016, at 14:02.